Who loves Fried Rice? *Raises hand and waves*. How about Double Pork Fried Rice? 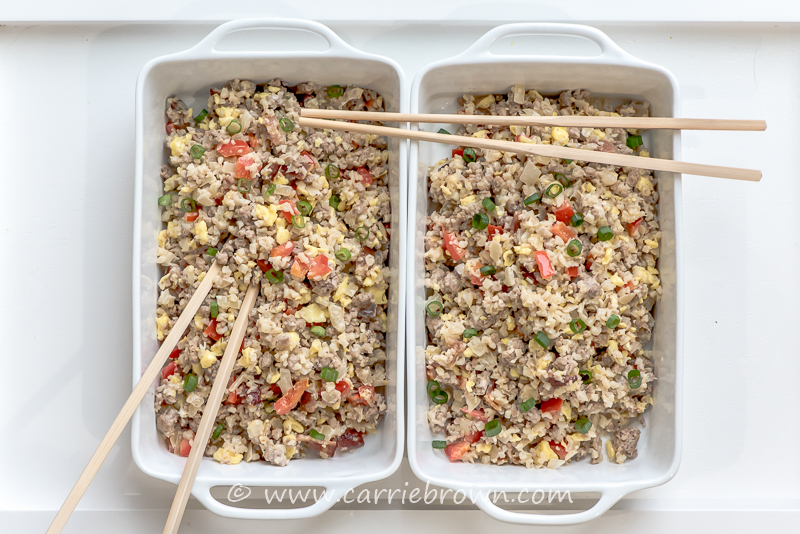 I hope if your hand is raised along with mine that you love this KETO Double Pork Fried Rice version as much I do. 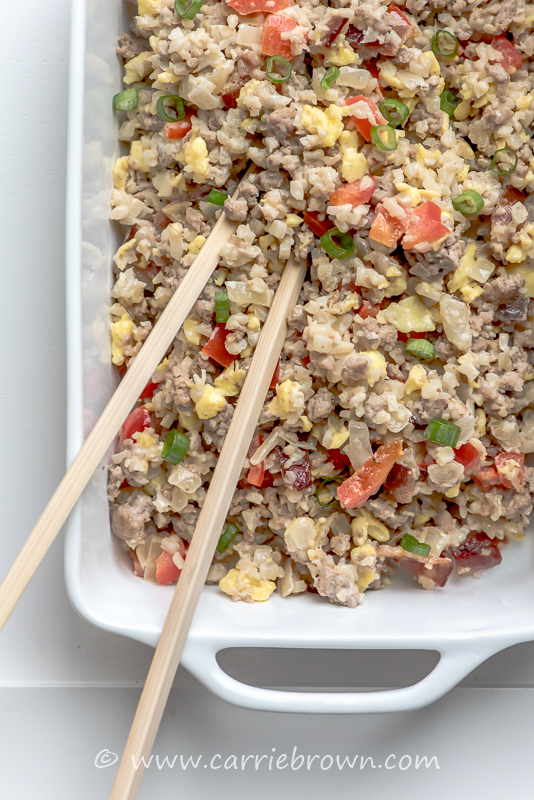 This Double Pork Fried Rice is super simple to sling together, and yet easy to make in a large batch and freeze in portions, or keep in the fridge and dine on for several days if that’s your thing. A handful of fresh ingredients that you likely already have loitering in your fridge, or can grab at any grocery store no matter where you live. KETO doesn’t have to be long, complicated, or expensive. Cooking doesn’t have to be hard or difficult. Cook yourself some delicious KETO food and then go out to play! 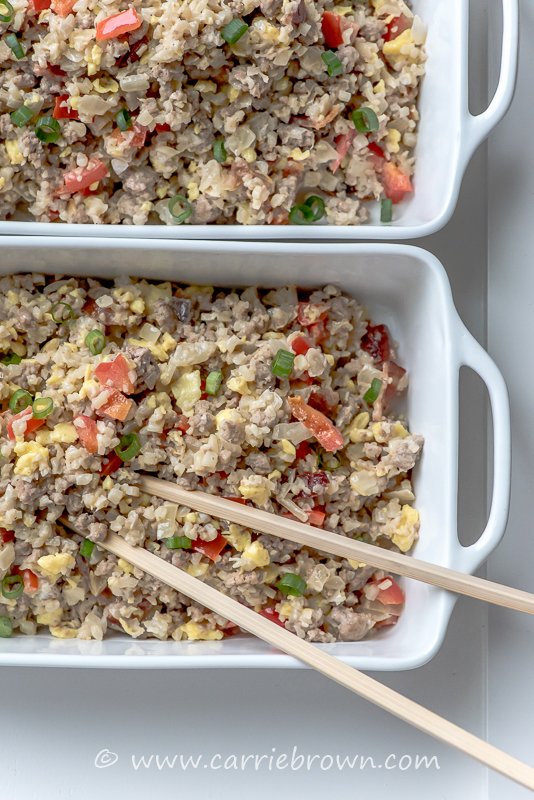 As well as an awesome meal straight from the pan when it’s finished cooking, this Double Pork Fried Rice would also be a great dish to take for a meal where you have access to a microwave and can reheat it – your work place for example. This wouldn’t be the best eaten cold because of the fat in the pork and bacon. Indulge your love of Fried Rice in a healthy, KETO way! Cook the ground pork in a pan over medium heat, breaking up the meat into very small pieces with a spatula as it cooks. Once it is browned, remove meat from the pan and reserve, leaving the fat in the pan. Cook the chopped bacon and onions in the fat in the pan for 5 minutes. Add the riced cauliflower and red pepper and cook for a further 10 minutes, stirring frequently. Meanwhile, pour the eggs into in a separate sauté pan and leave them to cook for 30 seconds, then move the eggs around. Let cook, stirring occasionally, for another minute until the eggs are dry. Remove from the heat and “chop” the eggs into small pieces with a spatula while they are still in the pan. Add the pork back into the pan with the vegetables and stir well. Turn the heat to low. Stir the cream cheese, cream, and cooked eggs into the sausage mixture until the cream cheese is completely melted and everything is mixed in. You could swap out the ground pork for any other ground meat, beef, chicken, turkey, or lamb, with lamb being the fattiest and turkey the least. You could also remove the casings from sausages and use those.